Should be a great day for Vin Scully! I wish I could be there. 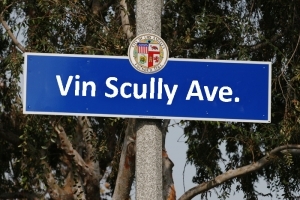 Vin Scully Avenue will be officially dedicated on Monday at 11:15 a.m. at the Gate A entrance to Dodger Stadium and the corner of Stadium Way and Vin Scully Avenue (formerly Elysian Park Avenue). Ceremony begins at 11:15 a.m.
We need your gaming background to be one of most interesting time you had changing any terrible disposition to a decent one. We trust that Frip2Game will be a first site where you'd like to come over and have some charming and amusing minutes with your companions playing free web amusements and talking.